October will be a wonderful month for looming! The first photo shows what the loom class group at yahoogroups will be featuring; two beautiful new patterns from the Loom Lady, Brenda Meyers. The first is a lovely "Falling Leaves Scarf", and the second project will be sweet pumpkin "loom"iaries. 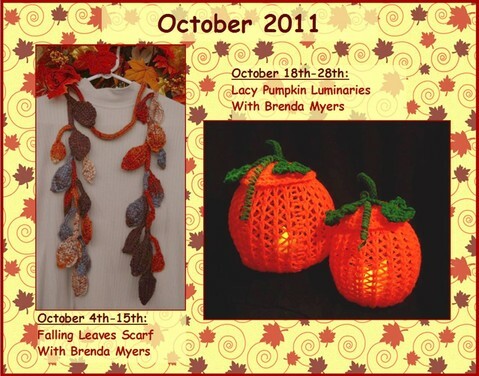 Brenda is a wonderful teacher, and it will be a treat to have her patterns for the class. Over at Ravelry, the Loom-a-long for October will be a beautiful Fall themed table runner. The pattern is from Bethany Daily of Gettin' It Pegged, who will also be hosting the loom-a-long. Bethany's sweet new book, "Loom Knitting for Little People" has just been published, another treat for October loomers. Just off of my loom, a faroese shawl in a pretty half circle shape. The photo shows the shawl being blocked. Copyright 2011 by Invisible Loom and Craft, Renee Van Hoy, all rights reserved. OMG, Renee!!! That Faroese Shawl is the most awesome shawl yet!! It reminds me of the Egyptian Wings of Isis. Also, thank you for the nice comments about the LoomClass projects.